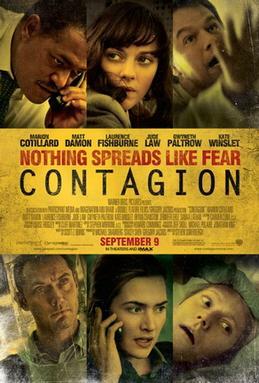 So recently, I mentioned a new movie was coming out named Contagion. There’s been a lot of interesting buzz surrounding the movie on the internet, and several colleagues and I were excited to see a movie about Epidemiologists. So we ventured down to our local theatre to check it out. I’ve tried to keep it as spoiler-free as possible, and I’ve tried to keep key details from being revealed. However, as with all movie reviews, if you want to be surprised by the movie, don’t read it. Contagion - In Theatres Now! Contagion is set in the present day, and tracks a virus outbreak similar to the recently H1N1, SARS and avian flu outbreaks. The story basically follows two main plotlines: the government, and then the public response. The governmental/public health agency plot follows the work of Dr Elliot Cheever (Lawrence Fishburne), Dr Erin Mears (Kate Winslet) and Dr Ally Hextall (Jennifer Ehle), among others. They’re tracking the disease from the CDC headquarters in Atlanta and are EIS officers (for a history of the EIS, check out my post on Alexander Langmuir). They start trying to determine what the problem is: what are the symptoms, who has it, how is it spreading, and then move into trying to develop a cure. However, they keep running into problems – the vaccine doesn’t work, and when they finally create an effective vaccine, there are shortages. For the first part of the movie you feel their pain: you are overwhelmed and wonder if they will find a cure, or if the movie will end similar to 28 Days Later with the eradication of most of the human race and a post-apocalyptic society emerging from the rubble (think Mad Max). Their constant work, and the shocking turns the story takes show you how draining their life can be. At one point Dr Cheever asks Dr Hextall “When was the last time you ate something that didn’t come from a vending machine,” and she replies “Taco Bell.” The human cost on these people is immense, and the movie captures this very well. The other aspect to the “governmental storyline” is the political trouble they face. Local health authorities have to protect their own interests, and do not want to cause panic and chaos unless they know the risk is real and the consequences of not acting are serious. As an audience, we are sympathetic to their plight, and frustrated with the turf war that occurs in the movie. In addition, we see the military response to the outbreak – both in terms of wondering if this could be part of a biological attack, and managing the populace (distributing rations, burying the dead). The movie doesn’t delve into this at the governmental/health authority level *too* much and simply touches on it in a few scenes to highlight the far-reaching consequences of the outbreak. The second angle deals with the public’s response through the eyes of Mitch Emhoff (Matt Damon) and his daughter Jory (Anna Jacoby-Heron), as well as blogger Alan Krumwiede (Jude Law). This is a much more intimate and personal perspective and compliments the previous angle very well. We see how quickly society fell apart once fear of the virus set in, and the lengths people will go to survive. The movie captured this beautifully, with the fear of the unknown virus, manifesting in relatively benign symptoms (coughing, fever) driving the action forward and propelling the plot ahead. Throughout this arc, you empathize with the public as they tried to escape infected areas, and the fear that pervades the cities as neighbourhoods are looted and riots break out over food. I really enjoyed this move and recommend it to all fans of the outbreak/thriller genre. The acting is subtle and believable, and Soderbergh’s direction is very good. The cinematography is interesting with the only bright colours being the orange hazmat suits worn by the lab workers in the CDC. The dreary skies, the dull colours all add to a feeling of despair and hopelessness felt by the characters. The movie makes you feel like you’re overwhelmed, and really captures the sense of dread and forboding that you know the researchers are experiencing as vaccines fail and the virus continues to mutate, spread and take lives. The balancing act between revealing what they know and containing the situation is nuanced, and the movie does a brilliant job of capturing how cautious we as scientists have to be. The story is extreme enough to be interesting, but not so extreme as to be unbelievable. You leave the movie being terrified of germs, and if there’s an outbreak, to stock up on water, cereal and shotguns. I’ll also suggest that if you’re interested in infectious disease epidemiology, I highly recommend reading Aetiology, Respectful Insolence and ERV. So what did you all think? Are you going to watch it? I probably will. Did you read Orac’s analysis of Jude Law’s character? I did. I thought it was interesting they included him in the movie, but he really helped flesh out the panic/societal response to the virus and really showed how people will try and profit from this sort of public health outbreak. Orac is a great writer though, and I really enjoyed how he drew parallels to real people. For those interested, Orac’s post can be found here.